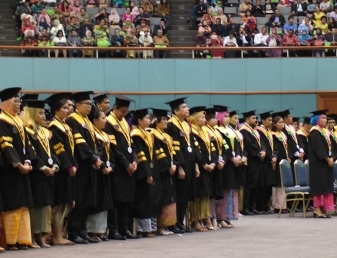 In keeping with its reputation as a higher education institution specialising in banking and finance, Perbanas Institute on 11th May 2016 hosted a graduation ceremony for its newest batch of globally-competitive graduates at the Jakarta Convention Centre. The event featured the theme of “Developing Innovative, Productive, and Entrepreneurial Human Resources during the ASEAN Economic Community Era” showcasing the institute’s efforts to keep up to date on the latest regional developments. Prominent attendees at the event included the Head of Perbanas Foundation Mr Sukatmo Padmosukarso, Coordinator of Indonesia’s Higher Education Coordinating Board Region III Dr. Ir. Illah Sailah and Perbanas Institute’s Rector Prof. Dr. Ir. Marsudi Wahyu Kisworo. The event also featured Chairman of National Economic and Industry Committee Mr Soetrisno Bachir as a guest speaker. Professor Kisworo through his speech, encouraged the latest graduates to take advantage of the fact that they are now well-equipped with the knowledge and skillset to fulfil their potential as Indonesia enters the new era of the ASEAN Economic Community (AEC). In working towards this goal Mr Bachir echoed the Rector’s sentiments and motivated the latest graduates to have the willingness to become entrepreneurs and to start and run a business. In his speech Mr Bachri demonstrated that entrepreneurship can contribute to job creation and economic growth, and highlighted the importance of technology and innovation as tools that can enhance the entrepreneurial spirit, and make Indonesia more competitive in the AEC climate. Perbanas Institute’s latest graduation ceremony demonstrates the high calibre graduates it produces; each ready to make an impact in the country’s banking and finance industry. This key sector needs a highly-skilled workforce to fully enhance its potential to support long-term projects such as the development of infrastructure and utilities. In hosting this graduation, Perbanas continues to commit to achieve its target of becoming a top banking and finance education institution in Asia by 2019.